It’s time once again to travel down the rabbit hole, as the lovely Leah shares her thoughts on the latest episode of Once Upon a Time in Wonderland! What Happened? Will and the Red Queen head off to attempt to build an army, and Alice and Cyrus go to find the Well of Wonders. Will and the Red Queen are captured by the Jabberwocky before they can achieve their goal and are brought to Jafar, where the Red Queen is forced by the Jabberwocky to use her three wishes. In flashbacks, we are shown how Cyrus and his brothers became genies when they stole magic water from the Well of Wonders to save their mother’s life. My Thoughts This week’s episode was interesting and a bit intense. There were a few things I really enjoyed as well as a few things that disappointed me; “Dirty Little Secrets” will not be my favorite episode of the season, but it also won’t be my least favorite. In flashbacks we are shown how Cyrus’s actions brought about his and his brothers’ fates. As a quick note—I thought it was fun to see that he and his family had lived in Agrabah, and that they had taken magic from the Well of Wonders, which I’m assuming is a reference to the Disney film Aladdin’s Cave of Wonders, which was where Aladdin found the genie’s lamp. It was a fun way to connect the two genie origin stories for those familiar with the Disney tale. In these flashbacks it was interesting to see a different side to Cyrus—we have already seen that Cyrus has a bit of a trickster side, but this younger Cyrus was one who was a bit dishonest, greedy, and reckless. He was less patient than the Cyrus in the show’s current timeline and less aware of how actions involving magic can have serious consequences. He did, however, still have that kind heart that we’ve seen at his core. The biggest surprise of the episode for me was the discovery that Cyrus’s mother is the same Amara who Jafar eventually trapped in his serpent staff. I had a feeling when we saw her wrapped in bandages that she was going to be someone we had seen before, but I was not expecting it to be Amara. We know she has magical powers, yet in this time in her life she obviously could not heal herself. It made me wonder if the magic water they used to heal her is what gave her the magic powers we see her possess when she is with Jafar. Hopefully, we will learn more about her in a future episode and perhaps get the answer to where her magic originated from. I’m really interested to find out what will happen now that all three genie bottles and Amara are in the same place, with Cyrus likely to be there soon. Is there some way that their combined powers and familial connection can help defeat Jafar? If nothing else, I’m sure we’ll get some sort of family reunion in the next few episodes. There were a few parts of this episode that left me confused. I couldn’t quite figure out how the “parting glance” spell that was cast using Lizard’s eyes revealed the Red Queen’s face, when I would assume it was supposed to reveal the last person that Lizard glimpsed before she died, which would be Will. Lizard was dead by the time the Red Queen got to her, unless the show is hiding something from us? Or, for magical purposes, can eyes see things past their owner’s demise? 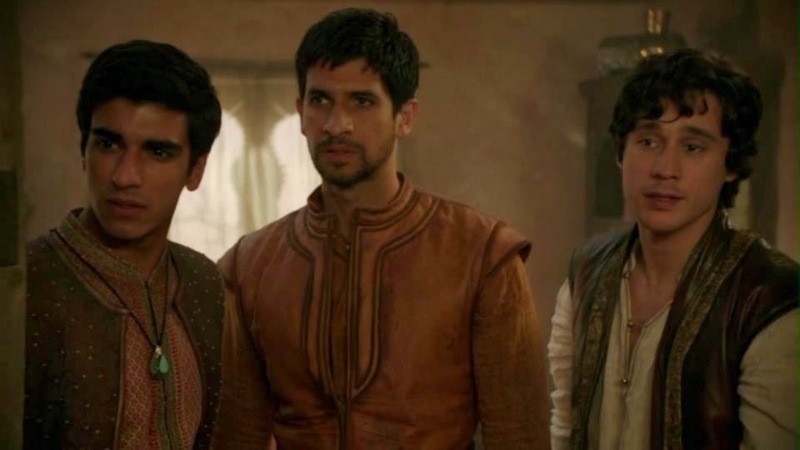 I also didn’t know how Jafar seemed to already know that Will was now the genie and not Cyrus, considering we’ve not seen him receive that information on screen, yet he didn’t seem surprised at all when the Jabberwocky brought Will and the Red Queen to him instead of Cyrus and the Red Queen. It’s not necessarily a big deal, but I was sort of expecting there to be some small moment of plot about Jafar discovering that Will was the genie now. I was also disappointed by the way that the breaking of the Red Queen seemed so easy. Wishing for the Jabberwocky to stop made sense to me, but for two of her wishes to be to wish for her crown and jewels? I was disappointed. I feel like, while material possessions were a draw for Anastasia when she decided to become the queen, I always thought that the power and control that came with that role were a bigger draw. I don’t know if the crown and jewels were supposed to be symbolic of her power as the queen and thus that was what she longed for so strongly, but I was disappointed that she couldn’t stop herself from wishing for something as fairly insignificant as jewelry when Will was in danger. I don’t know how far the Jabberwocky’s powers extend, but I assumed that it wasn’t total mind control. Therefore, I was expecting the Red Queen to put up a bit more of a fight than she did. Hopefully next week we’ll see her come up with a plan to free them all and defeat Jafar. Let me know your thoughts on this week’s episode in the comments below! This entry was posted in Leah's Thoughts, Television, TV Time and tagged leah, once upon a time in wonderland, recaps and reactions, television by Katie. Bookmark the permalink.